St Austell Printing Company gets in the festive spirit – in July! For most people on a sunny July day in Cornwall, Christmas is probably the last thing on their mind. 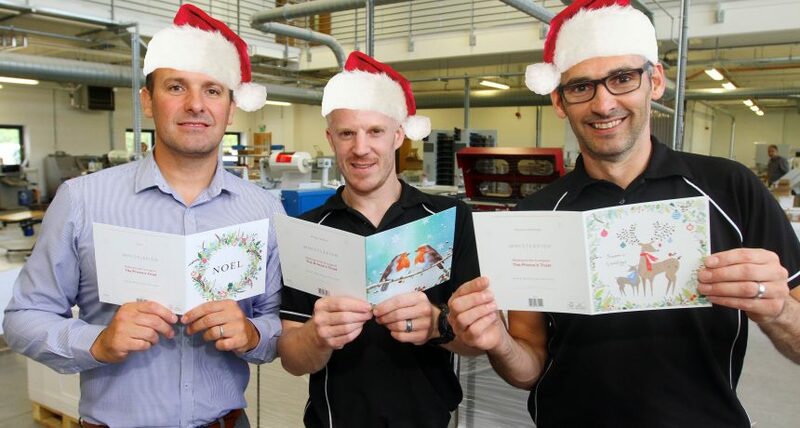 However, the festive season has come early to St Austell Printing Company as the team work hard to print nearly one-million Christmas cards. Milkwood Publishing, who own Whistlefish galleries have worked with St Austell Printing Company for a number of years on a range of products, including trusting the company to print their stock of quality cards ahead of the festive season. These will be stocked in Whistlefish galleries across the South West as well as available through their website. The cards will be helping to raise money for The Princes Trust, Cornwall Wildlife Trust and Battersea Dogs Home. Jon Hart, St Austell Printing Company’s regional sales and account manager said: “Once again we’re really proud to be working with Milkwood on such a prestigious range of products. There is a great deal of synergy between our two companies as quality and sustainability are at the heart of everything we both do. “Milkwood is a company that is proud of it’s Cornish roots, so it’s great that they are able to produce these cards here in Cornwall. The cards are available to purchase in Whistlefish Galleries across the South West, as well as online at www.whistlefish.com. From one sheet to large-scale projects, our experience and dedication to exceptional service means we are your friendly experts in print. Find out more about the products we offer here, pop into our Printshop for a chat, or give us a ring on 01726 624900. Pictured are Jon Hart, SAPC’s regional sales and account manager with Bindery Assistants Dave Pearson and Martin Powell.